The infamous Spinergy Rev-X. 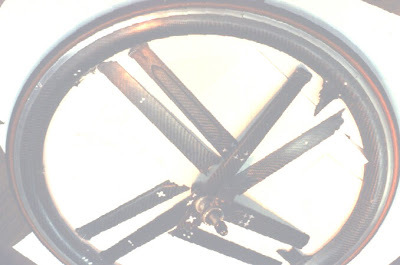 A number of catastrophic failures caused Spinergy to pull these wheels off of the market. This was in the 90s, before digital cameras were everywhere, so there aren't that many good photos of them. The Spinergy Accidents page only exists in the Internet Archive Wayback Machine now. Soon these wheels will be completely forgetten. I'm not sure about forgotten. Every pro I've ever talked to who raced them wishes, despite the failure issues, they were still legal and swears they were the best wheels ever. I've got two pairs in the garage I'll never part with. I have a set too. I used them in my cyclocross races...I loved these wheels...and I love them also now! In many years I had the possibility to use the most famous high profile carbon wheels on the market (Ambrosio X-Carbon, Zipp, Gipiemme, Mavic Cosmic carbon, ...) but the Spynergy are the best wheels I ever used in my life! I'll not forget them!